Strange, gentle creatures which lived in peace and harmony with their neighbours millions of years ago may have rivalled or even surpassed humans if they had they not been wiped out by our ancestors, according to a claim by experts in 1998. They stated that the bizarrely-shaped creatures, known as Ediacarans, were neither plant nor animal but a totally unique order of life. The experts believed that the creatures appeared out of mould and algae that characterised the beginnings of life on Earth about 600 million years ago and evolved rapidly to become Earth's most sophisticated inhabitants. Mark McMenamin, professor of geology at Mount Holyoke College in Massachusetts in the US, believed the Ediacarans were literally eaten out of existence by the influx of new animal predators. He went further by controversially claiming that by the time they were killed off, the Ediacarans were already showing signs of awareness and intelligence. The Ediacarans, named after the Ediacara Hills in South Australia where their fossils were first discovered, developed into a multitude of strange forms, including fronds and bulbs. However, they had no teeth, claws, or other physical features with which to prey on their neighbours. Instead they inhabited a prehistoric Eden, photosynthesising their own food, absorbing nutrients from the water around them. Some were attached to the sea bed, others were free-floating, and a few may have had crude fins. But Professor McMenamin pointed out that about the time of their demise, around 500 million years ago, the Ediacarans began to sprout intriguing new body parts such as simple antennae. In Professor McMenamin's view the creatures were beginning to evolve senses and even crude brains. Professor Jim Ogg, secretary-general of the International Commission on Stratigraphy (ICS), filled in some of the background: 'There's always been a recognition that the last part of the Precambrian is a special time before the first shelled animals appeared, when there are these weird, mesh-like creatures of uncertain affinity'. The Ediacaran period begins at the end of the last ice age of the 'Snowball Earth', or Cryogenian period, a term given to a series of glaciations that covered most of the planet between 850-630 or 600 million years ago (see related links, right). One theory proposes that these climate shocks triggered the evolution of complex, multi-celled life. Professor Ogg said many of the new life forms that appeared in the Ediacaran seem to be simple organisms, probably related to present-day sponges. 'Ediacarans were on a trajectory in which they would have developed into intelligent life, but it was cut short,' Professor McMenamin agreed in a report published in the New Scientist magazine. Other researchers have dismissed his ideas, claiming the Ediacarans were in fact the forebears of primitive animals such as jellyfish. 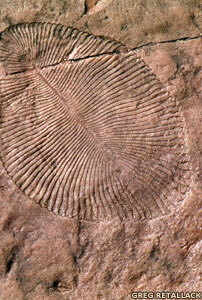 For decades the accepted view was that Ediacarans were animal ancestors. Then in 1982, Adolph Seilacher, from the University of Tubingen in Germany, announced that Ediacarans were not animals at all but a now-extinct class of life by themselves.